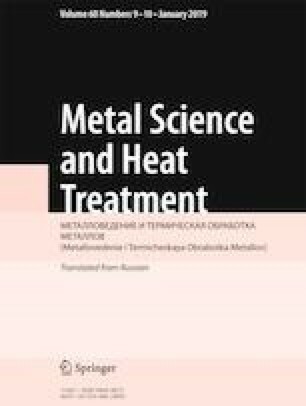 The nature of stability of dendritic microsegregation of rhenium in single crystals of intermetallic (γ′ + γ) alloys based on γ′-Ni3Al is determined under a high-temperature heat treatment and under creep and endurance tests. It is assumed that steady dendritic microsegregation of rhenium is a factor determining the high high-temperature strength of rhenium-containing (γ′ + γ) alloys based on γ′-Ni3Al. Translated from Metallovedenie i Termicheskaya Obrabotka Metallov, No. 9, pp. 41 – 47, September, 2018. The work has been performed with financial support of the Russian Foundation for Basic Research (Grants 13-03-00200-a and 13-0312133ofi m).